In the Golf Teaching world, opinions dominate the landscape. Every year there are new opinions that catch on and, for a brief period, dominate the pages of the golf magazines. In teaching, there have been opinions that the key to success lies in a big shift off the ball, or no shift off the ball, or a big turn, or no turn. For any aspect of the golf swing, so called “expert opinions” can always be found that are wildly contradictory. The list of contradictory opinions is long, but the result is that the individuals that promote their opinions to popularity are the winners, while the golfing population is usually the loser.eBay is filled with videos of past opinion fads,selling at pennies on the dollar. 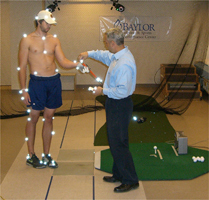 If a student is truly interested in improving their game, they should find a teacher that uses science as a guide to their knowledge base.Sports science has been used for over 30 years in the Olympic sports to guide the development of the elite athletes.Unfortunately, golf has not fully embraced this approach, which is the main reason that the handicap of the average golfer has improved little over the last 20 years. SwingModel is dedicated to providing those teachers and students a learning process that is based on scientific research. It may not conform to the latest fad, but it provides the user with what truly works in golf performance.